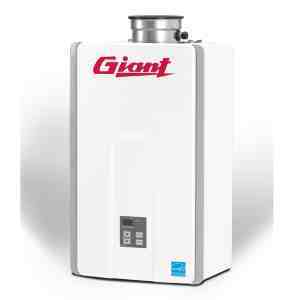 Review of the tankless water heaters from the Canadian manufacturer Giant. Explore the features and Energy Star compliant models. See the differences between non-condensing and condensing models. Giant tankless water heaters are available from two categories; non-condensing UGT (Comfort) and condensing UGTC (Performance) series, both groups designed to provide continuous hot water, on demand, by using the natural and propane gas as the fuel source. The main difference between these two series is that condensing UGTC models are more advanced; they utilize the condensing secondary heat exchanger that helps the units to take advantage of the heat coming from the products of combustion. This way incoming cold water is preheated while the exhaust gases are released with the lower temperature, resulting in higher efficiency and more installation flexibility. The energy factor on non-condensing UGT series is approximately 0.82, while on the UGTC is around 0.96, so less energy is wasted – making the units ultra-efficient and Energy Star compliant. UGT series has two sizes only: UGT-180 comes with the maximum power of 180,000 BTU and 7.5 GPM flow rate, while the UGT-199 is more powerful – 199,000 BTU and 9.8 GPM flow rate, making it great for larger houses. Both models utilize direct venting and are designed for the indoor installation only, utilizing vertical or horizontal venting setup. This means exhaust gases must be vented outside and from where the fresh air for combustion gets in. UGTC series has also two sizes: UGTC-152 comes with the lowest power of all, 152,000 BTU and 7.8 GPM flow rate, but the highest energy factor (EF) of 0.96, while the UGTC-199 utilizes 199,000 BTU and 9.8 GPM flow rate (EF is 0.95), also great for larger houses. Both models are also designed for the indoor installation with the vents that terminate vertically or horizontally. As the Comfort series uses only the stainless steel vents, the Performance series, due to the lower exhaust temperature can use PP also. Due to the high energy factor, both models are Energy Star compliant. Giant tankless water heaters can control a recirculation pump by using one of the two modes; economy and comfort, which is more efficient but has higher energy consumption. The recirculation provides hot water faster, and is used where there are long runs – the distance between the water heater and the fixture is too long. The small and compact size of approximately 30” x 18” x 10” allows wall mount installation and therefore space savings-reduced footprint. The units are equipped with the enhanced scale detection that reduces the possibility of scale building, keeping the great performance constantly high. For the easier temperature control and problem diagnostics, all the Giant tankless water heaters utilize the temperature controller that is integrated into the front panel. The controller is used to set and monitor the temperatures up to 140 F, or higher with the different controller and in commercial applications. Warranty on all models in residential applications is 12 years on the heat exchanger, while in commercial use, the warranty is only 5 years.